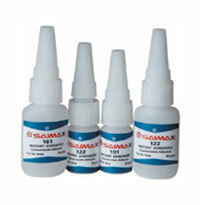 Saimax produces a variety of cyanoacrylate adhesives for wide range of automotive parts manufacturing and repairing applications. These instant adhesives are also used for many engineering and prototype applications. The products are useful to cure various applications including automotive trims, logos and badges, weather strips, knobs, and minor interior repairs. For curing various applications, Saimax offers exclusive and highly-effective adhesives that meet specific automotive requirements. There are adhesives used widely for snowmobiles, jet skies, bicycles, scooters, motorcycles, and much more. 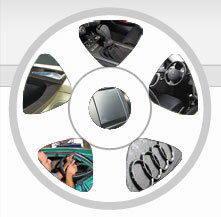 Applications: Automotive trims, logos & badges, knobs, weather strips, minor interior repairs, etc. This adhesive is specifically formulated for applying grips and mats for recreational vehicles. This adhesive is widely used on all makes of grips for jet skies, snowmobiles, bicycles, motorcycles, scooters, etc. Applications: Grip Adhesive. Assemble grip on vehicles, installing the mats, mounting logos, weather strips, minor interior repairs. This surface-insensitive, premium gel formulated to provide long lasting and stronger bond on wide variety of surfaces. This adhesive ideally designed to have no-run properties and can apply on vertical surfaces for heavy duty repairs. Applications: Automotive weather strips, interior minor repairs, badges, trims, knobs, etc. Applications: Aerosol activator to improve the cure speed of instant adhesive.